Money represents real-world value – and in dreams it often represents psychological / mental energy, or nourishment. So finding a treasure or being in possession of a lot of money in your dreams, may be a symbol of you being in possession of something psychologically very valuable. But money in the real world is not always associated with something good, and dreams of money og treasures therefore can be seen from several angles. These are reviewed below. 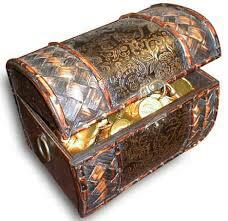 Money / treasure in dreams as a picture of something psychologically valuable. To dream that you suddenly find a lot of money or that you are in a secluded cave, or in a room in your house / apartment that you have never seen before, and find a great treasure – in this situation, money (treasure) is often a picture of something very valuable in yourself that you have not previously been aware of. It can be a talent, a competence you have (to write, paint, sing, count, analyze …. the list is endless! ), which so far has not been fully exploited. When you dream that you saw this treasure, then it means that your subconscious wants you to do much more about this talent. Just like the Biblical parable in which the moral is that one should use his talents and not bury them. An image of this inner treasure can also be that you dream that you find a pearl or a diamond. Money in a dream as something materialistic. It is clear that the language of dreams can also be very direct and talk about how you relate to money / values ​​in the real / awake world. Are you very materialistic in your thinking? Do you cluster to money, status symbols, etc. in your dreams? One could say that you, as it is now, need something outside of yourself to say that you are worth something. The message of the dream is then that you should try to find something in yourself that you can be happy about, that your self-esteem has to come from within and not from something outside yourself. Shopping / spending money in dreams. You can also dream that you’re spending money. For example you are in a shopping center and looking for something specific. This can be a picture of that you are frantically looking for the gratification of a (perhaps unconsciously / unacknowledged) specific need. Like anything else, you can also dream that you give counterfeit money to someone – as a picture of you might be fake / false in your communication / relation with certain others in the waking life. NOTE: Dreams are 100% individual, and when you dream about money/treasure, it’s almost certainly about something else for you than it is for your friend, who also dreamt about money/treasure. Dream interpretation / dream analysis is sometimes a difficult art, and a particular interpretation of a dream is only correct if you feel “affected” by it. Therefore, it is not certain that the above mentioned interpretations are relevant to you. please, what does it mean to dream of trying to avoid known people in a dream because one is carrying luggage of dirty clothes and also shabbily dressed. NB: I’m also in an expectant situation for the restoration of lost glory, though. i dreamed in the new organisation i have been chosen as a treasure. the give me a treasure box and i was the first one to donate in it. what does it mean? i dreamed i am fighting someone is following me i beat him and i ran on front of me i see other people want fight me but i desapure from them what does it mean? I dreamt about money i bury it then the other day i dream again about a room full of money. Just wondering whar does it mean. My “dream” I feel is “not a dream!??? It’s not abstract or surreal or erratic..its repeated for months and months and I’m convinced a memory!!! I literally know the location underground and remember walking down through the tunnels to a large vault FULL of very old treasures!! Shields chalices,armour but much more valuable relics…feels very very old and NOT religious more Definate and important..I keep having the same dream but as I say more it a memory!! I’m a very intuitive person and educated professional and not prone to folly!! I really don’t think I’m wrong here..i am very very often accurate at predicting or feeling things or people or outcomes..just not sure where to go with this but feel have to pursue it! !